A pictorial tutorial on some techniques for using Chain Lightning effectively. Scroll down to see the images and read the captions explaining what each one is illustrating. This is the kind of Chain Lightning cast we all strive for. The picture shows a high number of Chain Lightning streams all going towards the monsters ahead. None of the notorious Chain Lightning gapping is evident, mainly because the only monsters that the character has to deal with are ahead of him. If any of the monsters ahead survive this cast, then they will find another one coming their way soon enough, as a later set of 3 pictures will show. If any monsters off-screen are tickled by this cast, it will take them quite some time to make their way to the character. The only exception to this is Blinks on levels 3, 4 and 5, but they are easy enough to dispose of with a fast second cast of Chain Lightning. While playing through a Chain Lightning cast, have a little patience and wait until this cast progresses until it hits some walls. Then the character can decide what he needs to do next. It could be another cast of Chain Lightning, it could be some Stone Cursing, it could be some Fireballing. 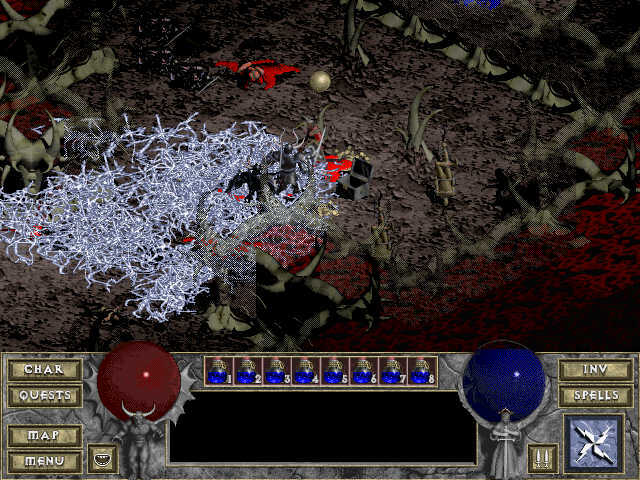 But most of the time, he would simply pick up some gold and good items from the corpses. 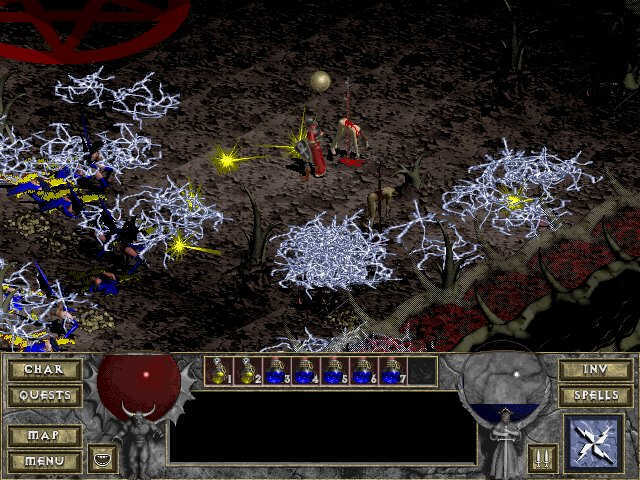 This picture of Chain Lightning gapping was kindly provided by Booga, character level 36 at Spell Level 10 on Normal level 15. This is what we are all trying to avoid. The streams from a single Chain Lightning cast are sent out to all the monsters within its range. But since each game-tile can hold a "Special Effect" and the special effect here is a Lightning Effect, one will find that a lot of the special effects are being used. These special effects can be spells or they can be arrows or traps from chests etcetera. There is a hard-coded limit for all these effects and this cast of Chain Lightning would have exceeded this limit. 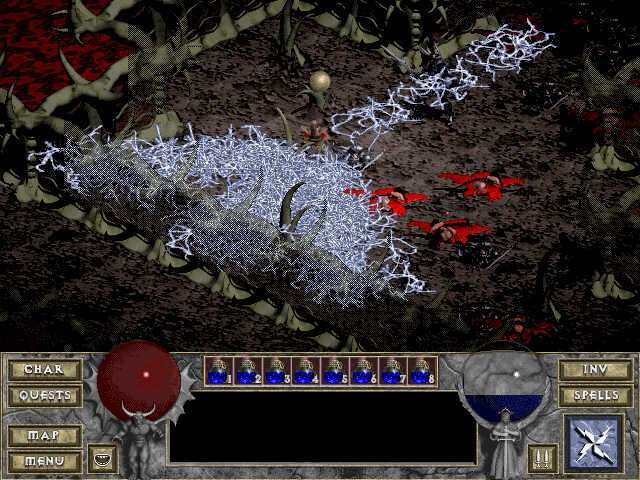 Thus the game stops producing the Lightning Effects in the middle of the Chain Lightning cast until some of the effects cease to exist, after which the remainder of the Lightning Effects can be recycled into the cast. This is the sole reason for the gaps that most people experience when their Chain Lightning reaches high spell levels. 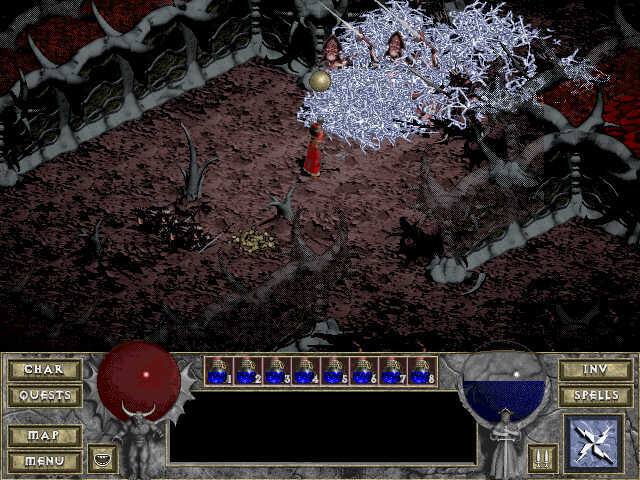 The most important ways of limiting the Special Effects to within the hard-coded limit with Chain Lightning are to cast only to the monsters ahead or in a small, reachable arc around the character. Walls and several other obstacles can be used to soak up unwanted effects as later pictures will clearly demonstrate. 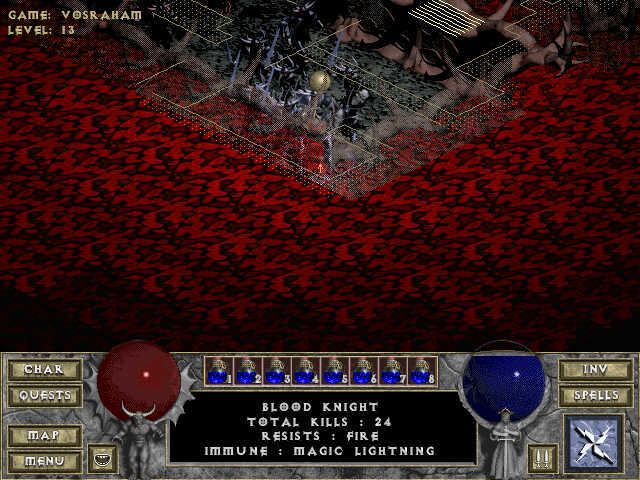 This picture of non-targeting Chain Lightning was kindly provided by Booga, level 39 at spell level 11 from Nightmare level 14. 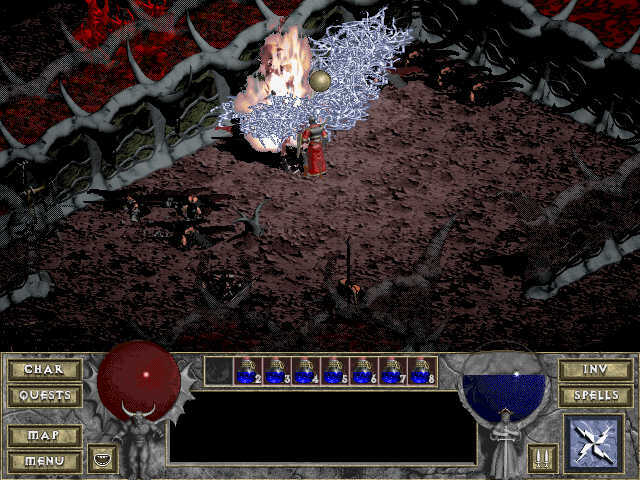 A recent find from early 1999 is demonstrated in this picture by a Stone Cursed Balrog escaping death by electrocution. The Balrog was stoned in the middle of a move between 2 game-tiles and Booga did cast repeatedly around the room to make sure that he wasn't "seeing things". It seems that if a moving monster is halfway between tiles or close to halfway, the game will skip detection of this monster when it comes to Chain Lightning. A lot of investigating is still to be done on this subject, but for now, let the reader be aware about this fact! Just an opportunist picture to show that even Artillery Mages (those with no effective Armour Class ratings) can get themselves crowded by slow moving monsters. All right, it was done on purpose in conjunction with the next picture. 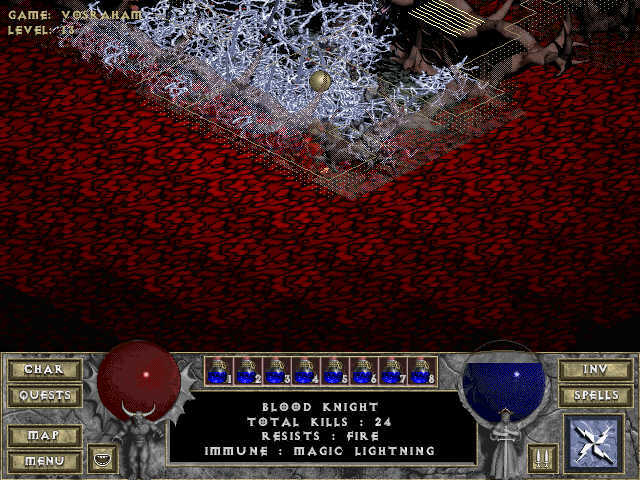 For now, let it be enough to say that Blood Knights are immune to Lightning spells, certainly to Chain Lightning. Take a note of the number of monsters and their positions. And now the next picture a fraction of a second later with only a slight difference. The difference is, of course, the Chain Lightning. And this Chain Lightning cast has absolutely no effect on the Blood Knights. They do get targeted. They do have streams of Lightning sent out to them. The streams do go through the Blood Knights. But they are immune to them. In conjunction with the 2nd picture about Chain Lightning gapping due to a high number of monsters being present, these last 2 pictures demonstrate that the Lightning immune monsters can make the problem worse. The extra monsters have extra streams of Lightning generated for them, thus eating into the Special Effects slots. 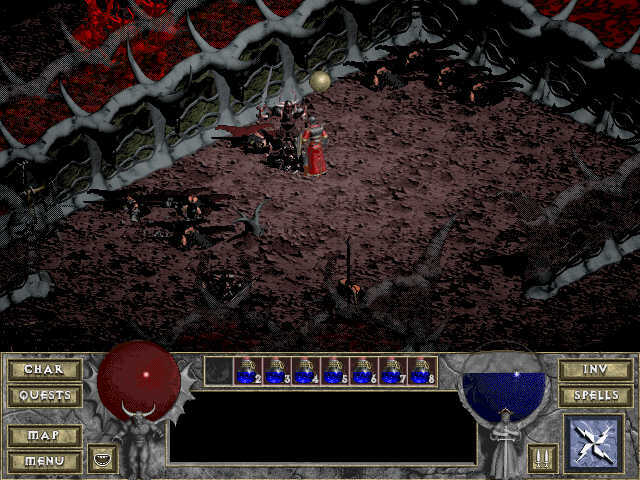 A solution to this is to Fireball the Blood Knights first if a character wants to use Chain Lightning on, say, Lava Maws or various types of witches. This concludes the introduction to Chain Lightning. What to aim for, what to avoid. Although only 1 picture was needed to show the proper use of Chain Lightning, 4 more have been needed to show how not to use Chain Lightning. The next pictures demonstrate various strategies to use with Chain Lightning. Is this another picture to annoy the web-surfers? After all, there is nothing happening here, right? Wrong! This is one of most useful of situations to use Chain Lightning in. The character has cleared a room. Okay, that is what most characters get good at in these parts of the game. The character has also cast Infravision. Okay, a good ploy to see ahead and around corners and behind walls. The character knows now what monsters he is dealing with and where they are. Turn to the next picture to find out. So you got yourself a Black Knight for company. But not for long, since I don't like aggression displayed in public like that. All right, you said this guy is in place, but why? To demonstrate a very useful technique with Chain Lightning. And what exactly are you trying to achieve? The monsters behind the wall will act as Chain Lightning stream multipliers. What is that in English? Turn the page to find out. Oh, now I see! Instead of a single stream for the monster and a second stream for the mouse click, you get lots of streams for all the monsters within reach. This is a great way of creating a sea of static and wipe out all those vulnerable to Lightning. ... this time the monster doesn't get even a fraction of the damage of the hapless victim from 2 pictures back. Clearly the character would be much better off to stand on the other side of the Steel Lord and then unleash the destructive power of Chain Lightning. Getting stuck in a corner with all sorts of monsters coming at you need not be the end of it all. Just be sure that you have enough time to get a cast of Chain Lightning going before they actually swing at you. Even Warriors and Rogues can dish out a great deal of damage in these tight situations as Lightning and Chain Lightning cannot be blocked by the monsters. This means that a high level Rogue or Warrior with medium levels of Chain Lightning (7 - 11) can do more damage than a lowish level Sorceror with a maximum Chain Lightning level of 20 (see the introduction for more about the technical aspects of the Chain Lightning spell). It is better to cast than to freeze in a panic situation, so go ahead, you don't have much to lose when you are stuck in a corner anyway. Level 14. 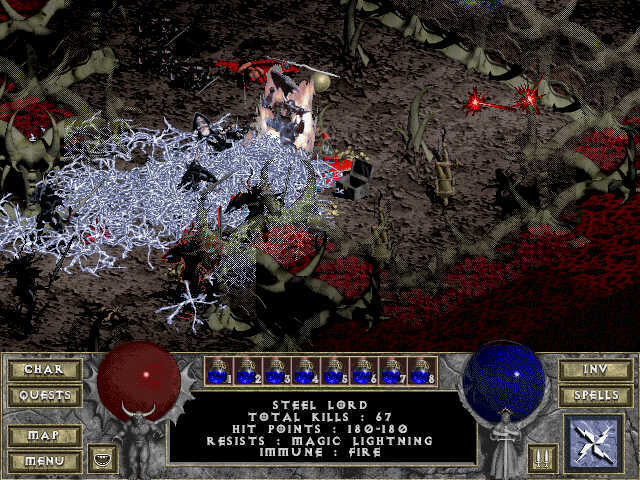 Steel Lords and Hell Spawn. They are Lightning Resistant, Fire immune. You fight your way through half the level. You are sick of those monsters coming at you. At last you kill their bosses Stareye and Steelskull. This only infuriates the remaining monsters. You can't find the stairs down, yet they can't be far off. You decide to go for it. Teleport, Teleport, Telep... AARRGGHH !~!~! You went the wrong way. Activated too many monsters. You fall back, but their numbers are many. Too many. They are overwhelming you. Mana is getting tight. HOW DO I GET OUT OF HERE ?~?~? With the power of Chain Lightning, it is actually quite easy. As has been said time and again, positioning is everything. The preceding pictures should have driven this point home as well, but now is the chance to show how a series of casts fit together. This is cast 1 in a set of 3. First of all, notice the position of the character behind a constriction between 2 rooms. This constriction will serve to channel the monsters closer together. Thus your field of fire is reduced a bit and the resulting Lightning power will be all the better for it. The technique is shown inbetween 2 rooms, but applies equally well to corridors, both long and small. At an initial glance, notice that the character only has to deal with monsters in front of him. This is due to Teleporting backwards into old territory (even if there is no automap to show this). Next, getting the first cast is crucial. Were the monsters to catch the character now in mid-cast, he would be done for. Again, he who hesitates is lost. After the first cast, it is important to give the streams a bit of time to disperse, after all, they could go as far as 2 or even 3 rooms on certain levels. Even the entire length of the level in some corridors, especially lvl 15 corridors. While the streams move along, they do damage to all the monsters they touch, so don't think that nothing is happening when they are offscreen. Plenty of work is being done by them, as the next 2 pictures will show. As the first wave of Steel Lords is obliterated by this cast, the next wave is on its way. Ouch, that was close ... One of the Steel Lords almost got a hit in. Well, I can't have that. Better cast again. The first cast would have awoken plenty of foes still out there. A sad fact, but easily seen from the number of streams of Chain Lightning still proceeding forth from the character. So this is another way in which Chain Lightning can serve you well. It has the ability to act as a RADAR and warn you about the monsters ahead. Some of the more astute web-surfers may have noticed the bottom Steel Lord escaping the streams. Well, that is hardly surprising once you know that this picture was taken before the editor was aware of the non-targeting of moving monsters. Have no fear. The second cast is well under way without any danger to the character. Okay, this is the last one for now. Several things should be clear from these last 3. You don't have to move in order to kill the monsters. Let them come to you, don't go looking for them until the current crop is harvested. Keeping a cool head is the best thing anyone can do. 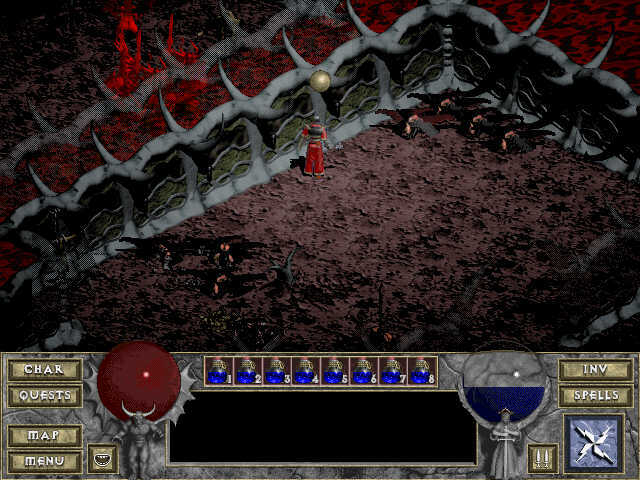 Playing among the Hell level monsters will get the player good at dealing with the Hell level monsters. Playing with high level Chain Lightning will get the player good at using high level Chain Lightning. So go out there and practice. If anyone is scared that they will lose their items, quite simply leave them in town while you go down for your training. The editor used to take both his level 40+ Sorcerors into Hell/Hell with less AC than naked (Scavenger's Carapace has from -6 AC to -10 AC and a Gnarled Root or Celestial Star will reduce that AC even further). 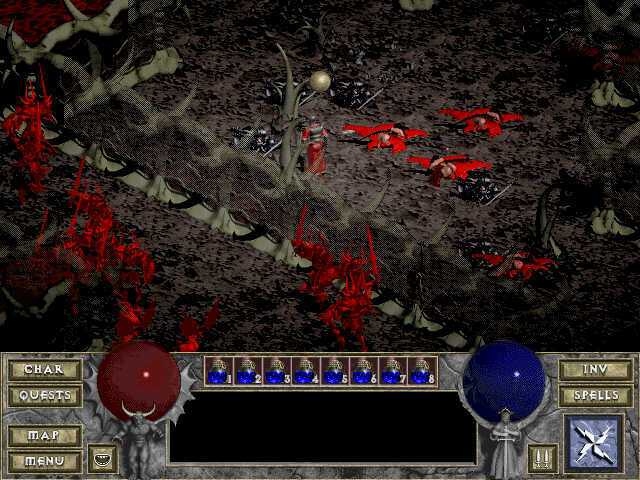 Sorcerors are made to wipe out the monsters from a long way out, but with a bit of practice, Rogues and Warriors will benefit a lot too from Chain Lightning by using the simple techniques described here. But be warned, the other classes have a casting time much slower than the Sorceror, so give yourself plenty of space. Use the weapons they are good at as well as the spells. Above all, have fun. This chain lightning tutorial was created by Moriah.